On Windows, you'll use the Adobe Gamma utility to calibrate and characterize your monitor. 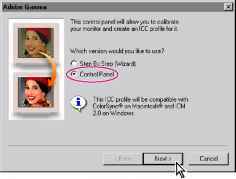 The resulting ICC profile uses the calibration settings to describe precisely how your monitor reproduces color. In this section, you'll load an existing monitor profile as a starting point for calibrating your monitor. Note: Adobe Gamma can characterize, but not calibrate, monitors used with Windows NT®. 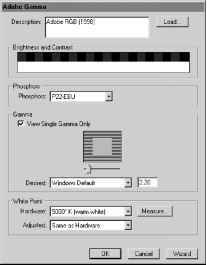 Its ability to calibrate settings in Windows 98 depends on the video card and video-driver software. In such cases, some calibration options documented here may not be available. For example, if you're only characterizing your monitor, you'll choose the default white point and gamma, but not the target calibration settings. 1 If the Control Panel is not open, choose Start > Settings > Control Panel. Then doubleclick Adobe Gamma. Note: If you are running Windows XP and do not see the Adobe Gamma icon in the Control Panel, try changing the View menu selection to Classic View. You can use either the control panel or a step-by-step wizard to make all the adjustments necessary for calibrating your monitor. In this lesson, you will use the Adobe Gamma control panel. At any time while working in the Adobe Gamma control panel, you can click the Wizard (Windows) or Assistant (Mac OS) button to switch to the wizard for instructions that guide you through the same settings as in the control panel, one option at a time. 2 In the Adobe Gamma wizard, click the Control Panel option, and click Next. The next step is to load an ICC monitor profile that describes your monitor. This profile serves as a starting point for the calibration process by supplying some preset values. You'll adjust these values in Adobe Gamma to characterize the profile to match your monitor's particular characteristics. • If your monitor is listed in the Description area at the top of the control panel, select it. • Click the Load button for a list of other available profiles, and then locate and open the monitor ICC profile that most closely matches your monitor. To see the full name of an ICC profile at the bottom of the Open Monitor Profile dialog box, select a file. (Windows profile filenames have the .icm extension, which you may not see if the extension display is off.) Make your choice, and click Open. • Leave the generic Adobe monitor profile selected in the Description area.